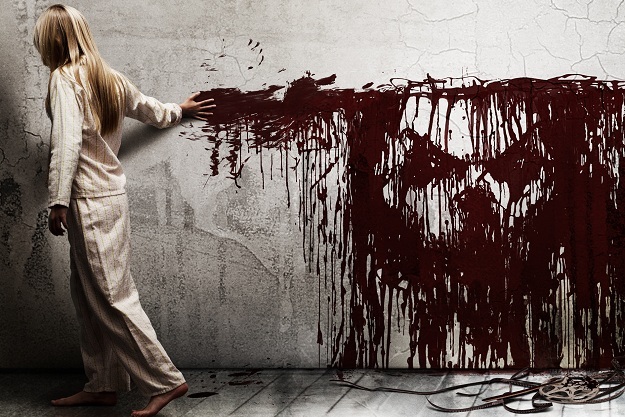 You know we love our horror movies here at aclockworkfiction, so you can imagine our excitement when we heard about the new supernatural horror film directed by Scott Derrickson (The Exorcism of Emily Rose, The Day the Earth Stood Still) simply titled Sinister. The film opens on Super 8 footage where a family of four are standing under a tree with bags over their heads and nooses around their necks. The family is lifted by their necks and strangled until they are dead. True crime writer Ellison (Ethan Hawke) and his family move into the house several months after the brutal murders, Ellison discovers a box of home movies in his attic, that puts his family in danger…. and so the film begins. The marketing for this movie is somewhat creepy as well, a viral site for the film makes a link to send to friends that opens a “news” article about a “Sinister Killing”, with re-used text saying that “4 dismembered bodies were found in the backyard of a residential home” and so on. Errrrrr this film sounds pretty farkin awesome….bring it on, in cinemas this month! This entry was posted on Friday, October 12th, 2012 at 5:10 am	and posted in Uncategorized. You can follow any responses to this entry through the RSS 2.0 feed.